Expertly developed to make your everyday cooking processes quicker and easier, our high performance range of Bosch microwaves will save you both time and effort when it comes to serving up your favourite dishes, every day of the week. Used by families and professional chefs alike, a Bosch microwave really will become a welcomed addition to your kitchen, speeding up the cooking process involved in creating the dishes your family loves to tuck into. Embracing the very latest technology, all of our Bosch microwaves come complete with a number of automatic programmes for excellent cooking results, as well as a weight option for different ingredients that will allow you to use your microwave with confidence. Our wide-ranging collection of Bosch microwaves encompasses a variety of different models that are suitable for both home and professional cooking environments. Within our range you will find products such as the Bosch Series 6 HBC84H501B Built-in Combination Microwave - Stainless Steel and the Bosch CMG656BS6B Built in Smart Combination Microwave - Stainless Steel. 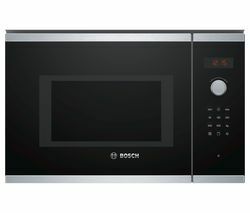 One of our most popular microwaves is the Bosch Series 6 HMT84G654B Built-in Microwave with Grill - Stainless Steel. With its 8 user friendly programs, 25 litre capacity and a number of microwave and grill options to choose from, this versatile and highly reliable Bosch microwave will allow you to prepare and cook a whole host of dishes, to the highest possible standard. Featuring a large digital display that provides information such as cooking times and the time of day, this innovative microwave solution will allow you can stay in control of your cooking. And if you’re struggling to find the right microwave for your requirements, why not check out our fantastic collection of Panasonic microwaves and Russell Hobbs microwaves. Of course, our friendly and helpful team is always on hand to answer your questions when it comes to pointing you in the right direction to products that met your needs.